Would you use harmless but effective colloidal silver and essential oils to save your litter from Parvo virus or stick to prescription antibiotics? Thieves and colloidal silver enhance the effectiveness of antibiotics and this is how they totally stopped parvo virus in my puppies! One of these products is “Thieves”, a combination of essential oils and the other product is Colloidal Silver. There are many companies that produce these products. I prefer to distill Colloidal Silver myself because I use so much of it. I won’t go into the science of how colloidal silver is produced and its mechanism of action. If you are interested you can go online for that information. The old axiom “Necessity is the mother of invention” caused me to search desperately for an alternative to save my puppies. Several years prior one of my mother dogs had a puppy that was stuck in her birth canal at about two in the morning so we had to travel to an emergency vet. That was my first experience with a c-section so you can understand how scared I was for Bella. I called the veterinarian! After they had done the surgery I was called in to assist with the puppies. As we were working with the newborns the vet assistant went into a room right next to us. I asked her where she went and she said she was checking on a parvo puppy. I had never had any experience with this disease at that time so I just thought she knew what she was doing! I took Bella and her eleven puppies home. The next day she and her puppies were doing well. That evening I moved her in with another nursing mother. The next day when I checked on my moms and puppies for the last time I noticed Bella’s puppies seemed very quiet. Something seemed wrong so I got up a couple of times during the night and they weren’t nursing like they should have been. By morning the litters were not acting right. I called my vet and asked him if he would please come out and look at them. We took temperatures and they were elevated. He prescribed antibiotic and left. By that afternoon all of my puppies were sick. I called a “specialist” in. By the time he arrived we had diarrhea. He took some tests and called me later to tell me that they had parvo. He also said that when the puppies started to die would I please bring one of them in for an autopsy because he would like to know what strain it was for his research. I could hardly stand up. He said there was very little to do that made any difference. First I cried for me and then I cried out to God. "Lord please help me" and He did. I went to the local pet store and told her what had happened, she said that she had a product called Colloidal Silver. She sold it to her human customers for cold and flu. I bought all she had. I thought that if it worked for those viruses why not for parvo? So I took it home and started giving it to my puppies. Colloidal Silver has been used since ancient Greek and Roman times as an antimicrobial for preserving food and liquids. 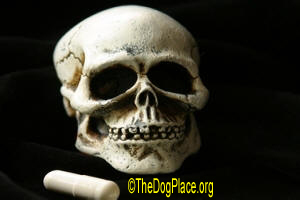 Then in the 20th century, allopathic medicine monopolized all medical practice with synthetic pharmaceuticals. My granddaughter and I wore hospital gowns and covered our shoes when we were in the nursery and changed clothes after coming out. We washed down the floors and the walls with bleach and after drying, we used a mist of Thieves in water. In two days my puppies were eating and in a week they all were well. I have tried other products but I use these exclusively now. Do I use antibiotics? Yes when I feel it is necessary. I will use anything to fight a disease state, but only on a very limited basis. 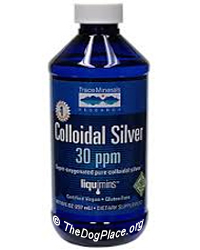 I use Colloidal Silver to spray my dogs’ teeth. It removes the tartar so that I don’t have to have their teeth cleaned under anesthesia. I use it full strength in a small spray bottle (one ounce) and I add 5 or 6 drops of Thieves. I shake it up before I spray the teeth because you are using an oil and water product. If I have an infected tooth I put the thieves on my finger and rub it into the gum around the infected tooth. Remember to cover the sprayer with dark paper or keep in a dark area. The light affects both Thieves and Colloidal Silver. Do they like the taste? No! But I also have a can of tuna that I let them smell right after I spray and that leaves them with a positive that they remember. Smell is very important and powerful in dealing with the behavior of dogs. When I take a dog or puppy to the vet I always have Thieves in a spray bottle (1 quart of water to 12 drops of thieves). I spray their foot pads and I cover the dog’s eyes and spray on the head and back of the dog. I do the same when I leave the vet BEFORE I put them back in the car. This is a safe and easy treatment to prevent something infecting your kennel. Remember to shake the sprayer before you use it. I hope that this information helps someone. 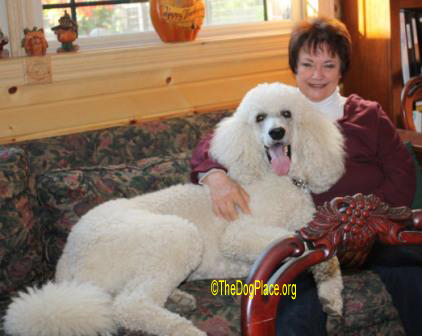 I am not a scientist, I’m not a doctor or a vet; I am a dog breeder who has to glean all she can from those professionals in order to take care of my animals. 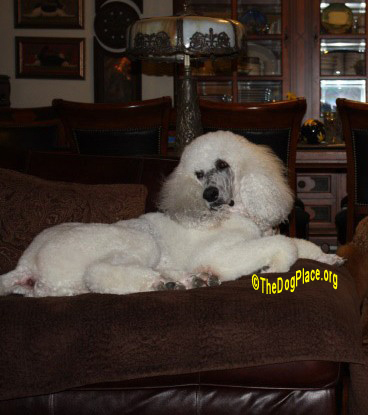 I feel that our dogs have given us their very best and we owe it to them to give them the very best we can. 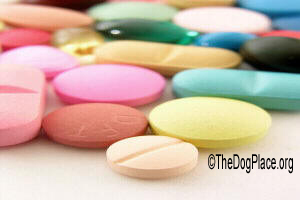 The sick truth about DogMeds and human prescriptions. Death toll rises from pain medication, including Rimadyl.